People like to use password to protect their PDF copyright from copying, printing, editing or stealing by others. So sometimes you need to remove password from a PDF for editing, copying or sharing. 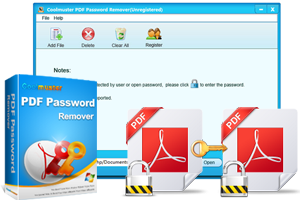 Under this situation, Coolmuster PDF Password Remover can be an ideal assistant for you to remove password as you like. 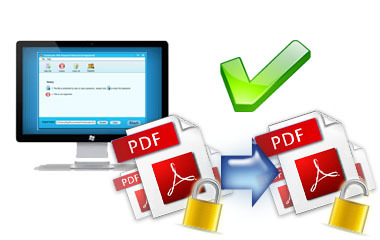 Get rid of owner password from PDF for printing, editing, copying. Easily crack open password if you can type the right password. Forget the PDF password so that you can't edit, copy or modify your PDF contents freely? 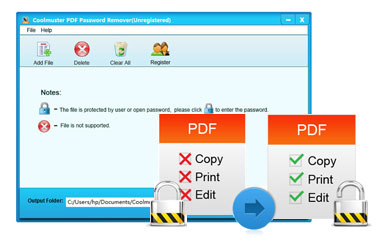 Don't worry, here you can use the recommended PDF Password Removal program to decrypt PDF password within a click. 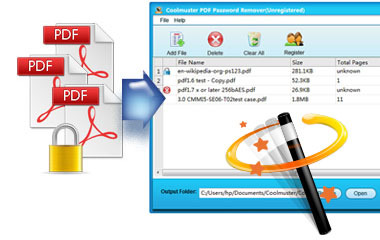 Coolmuster PDF Password Remover provides two different decryption modes for users to quickly remove password from Adobe PDF files. Batch Decryption Modes: You're enabled to crack up to 200 PDF files at one time. Right-click decryption: Right-click on any PDF file which you've imported into the program, and then remove it as you like. After decryption, you can reuse the PDF for any purpose as you like. View PDF files freely, as well as copy content, print PDF as you like. Edit PDF like add/delete texts, insert image, make annotate, etc. Convert PDF to other formats to satisfy your own specific needs. Extract PDF images and upload them to PowerPoint presentation or share online freely. Just like the saying goes "Time is money", so finding a time-saving program to crack PDF password seems to be so important. Here, Coolmuster PDF Password Remover comes here to meet your demands. Regardless of your input document size, this program can process at high speed. NVIDIA-GPU is available to accelerate more CPU power to this PDF password unlocker. The more CPU cores you have, the faster speed you will enjoy. No need to worry about installing more plug-ins on your Windows. And your data and personal info are protected. Just within 3 simple steps: Launch - Import - Decrypt, the restrictions will be removed flawlessly. Do NOT need Adobe Acrobat software installed onto your computer. Provide 7*24 free technical support service to both free trial and register users. Easily convert PDF to 7 different file formats, such as ePub, Word, HTML, Images, Text, Excel and PPT with no quality losing. Want to extract images from PDF for further using? 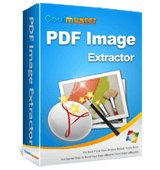 Take it easy, you can do it with this powerful PDF Image Extracting program.